These BC Racing BR Series Coilovers are perfect for either street driving, road course or autocross racing. These BC Racing coilovers feature easily accessible adjustment knobs for fine-tuning your compression and rebound. There are a total of 30 levels of dampening force adjustments for compression and rebound possible. The benefits do not just stop at dampening force adjustments, these coilovers allow for ride height adjustment to your specific need. You choose how low or high you want your Fusion, Milan, or Zephyr/MKZ to sit and BC Racing's patented concave lower locking ring keeps it locked in securely. BC Racing's systems offer optional pillow ball mounts to provide the most response possible from your suspension, and to sharpen your steering response. 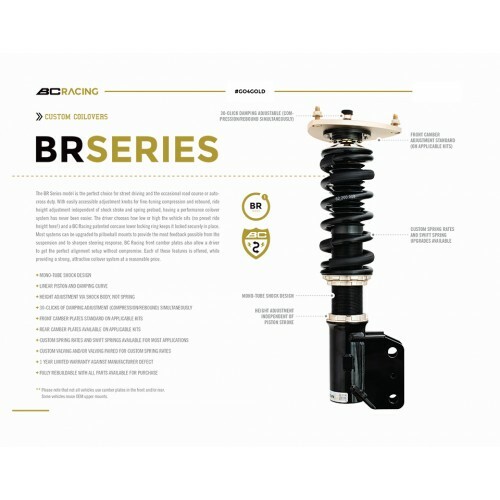 This BC Racing Fusion BR Series Coilover System also features front camber plates and rear camper plates in some applications. The camber can be adjusted on these kits 3 degrees depending on the level of drop. Note: Cash Back Points not applicable for this product.